Designed for powerboat users, sailors and racing sailors who demand high performance, ease of operation and feature integration, the GPSMAP 7407 chartplotter with 7-inch multi-touch widescreen display has a 10 Hz internal GPS that updates position and heading 10 times per second. It is fully network capable, including the Garmin Network and NMEA 2000, and offers the conveniences of built-in Wi-Fi� connectivity. 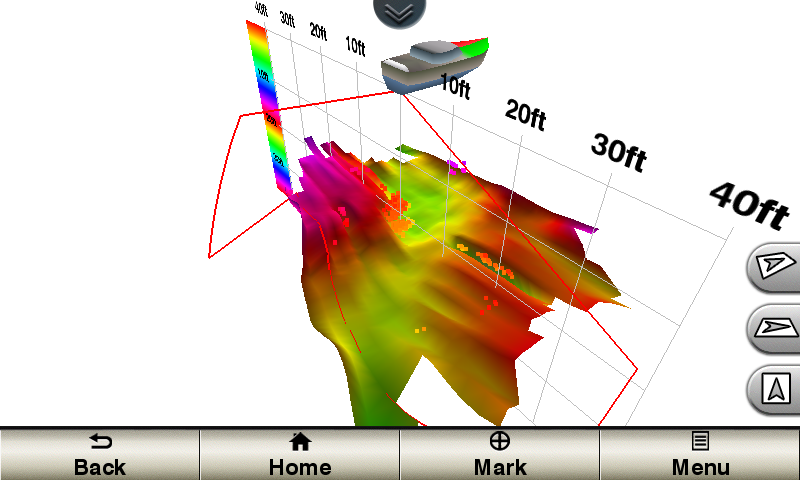 With the optional BlueChart g2 Vision, you can add a whole new dimension of exceptional features to your chartplotter. MarinerEye view and FishEye view provide a 3-D perspective, both above and below the waterline. High-resolution satellite images and aerial photographs help orient you in unfamiliar areas. Supported sailing features include laylines, enhanced wind rose, heading and course-over-ground lines, true wind data fields and tide/current/time slider. Gauge displays are designed to provide important need-to-know information at a glance, including true and apparent wind angle, set and drift, true or apparent wind speed, horizontal or vertical graphs, and a data bar with customisable data fields. Full-network compatibility allows you to add more capabilities to your boat. GPSMAP 7407 supports radar, autopilot, instruments, multiple screens, FUSION-Link, sensors, remote sonar modules, digital switching, thermal cameras, GRID rotary knob, joystick and keypad control, and more. GPSMAP 7407 allows you to share features with other compatible GPSMAP units, such as radar, GSD 24, GSD 26 sonar modules, supplemental maps, and user data, including waypoints, routes and tracks. User data entered into 1 chartplotter can be automatically synced with other chartplotters in a network. Fast, responsive 10 Hz GPS/GLONASS refreshes your position and heading 10 times each second to make your movement on the screen more fluid. It makes dropping up to 5,000 accurate waypoints � and finding your way back to them � quick and easy. Garmin gWind, gWind Wireless and gWind Race transducers feature twin-fin technology with 3-bladed propeller. Connect to the NMEA 2000 and compatible Garmin chartplotters via the GND� 10 black box bridge. Garmin Helm allows you to view and control your compatible Garmin chartplotter from a compatible smartphone or tablet while providing enhanced situational awareness for the mariner. Easily switch between portrait and landscape mode to accommodate mounting preferences. When using an iPhone� or iPad�, you can even record a movie of your chartplotter screen to share with friends and family. Download from The App Store� or Google Play�. With BlueChart Mobile, a free app downloaded from the App Store, you can plan marine routes on your iPad or iPhone then wirelessly transfer them to your boat�s compatible networked Garmin chartplotter. Even if you don�t have a Garmin chartplotter, you can still take advantage of the tremendous features of BlueChart on your Apple device. Better still, with enhanced Version 2.0, you now have access to even more features and capabilities. You�re able to adjust the calculated Auto Guidance pathway by inserting �via� points at interim stops or landmarks along your desired route. You can easily review hazard points along your calculated path. And you can even engage your compatible Garmin autopilot to follow the Auto Guidance route, automatically. Other 2.0 enhancements give you the ability to calculate arrival times at any point on your route (great for timing arrivals to correspond with bridge openings and other time-critical events). Better still, you can now save your plotted Auto Guidance paths for future navigation by backing them up on an SD� card with your BlueChart� g2 Vision� or Lake V�� HD Ultra cartography�. This exclusive SOS safety assist feature makes it easier for anyone � even those not familiar with marine electronics or radio protocols � to quickly call for Coast Guard help in an emergency. By simply tapping the SOS button on the chartplotter�s touchscreen display, your networked Garmin VHF radio will automatically tune to the Channel 16 emergency frequency and a list of possible situations (Ffire, man overboard, etc.) will be displayed. Once the applicable choice has been selected, the screen will provide a Coast Guard approved VHF radio distress call script, along with the ship�s current lat/long GPS coordinates, that can be read off to responders � thus saving time, averting panic, and providing the essential information needed by rescuers to assure the best possible outcome. If you have waypoints, tracks or frequently used routes stored on another manufacturer�s GPS product � or on a Garmin handheld device � now it�s easier than ever to transfer those items to your new Garmin chartplotter, via industry-standard GPX software formatting. GPX is an open standard format for GPS data exchange across platforms and applications. With this easy-to-use interface technology, Garmin has taken �no waypoint left behind� to a whole new level of trade-up convenience. With 1 Panoptix Down transducer, you get 3 remarkable views, allowing you to actually see fish and bait swimming around under your boat � in real time. You can even see fish in the water column in 3-D, from the bottom to the surface. You can be stationary yet still see things in 3-D below your boat. 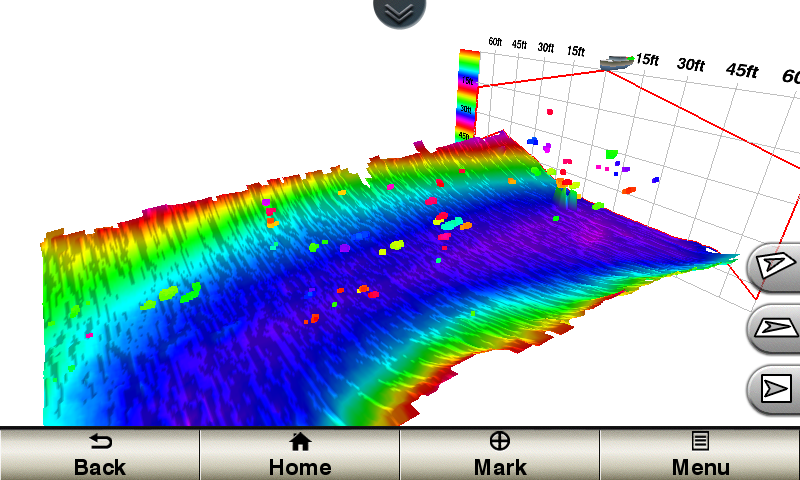 Scrolls through the data as the boat moves to show the history of entire water columns � from the bottom to the surface and all of the fish in between. This screen shows the boat passing over a stream channel with a school of fish between 30 to 40 feet. 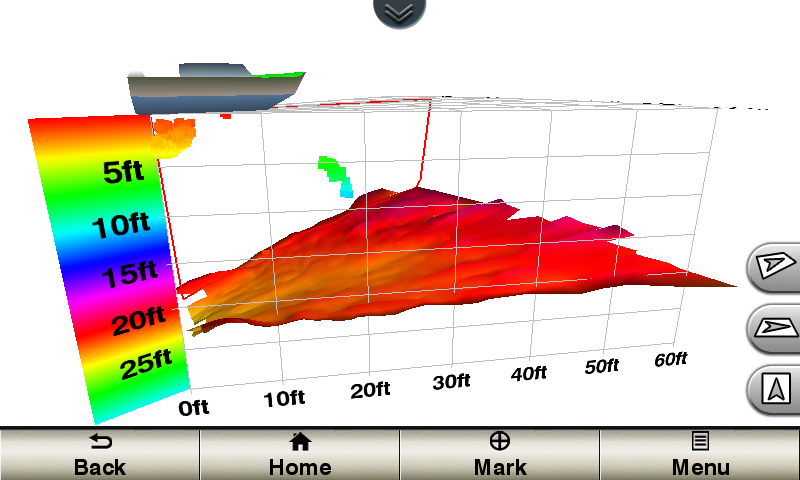 One Panoptix Forward transducer provides 2 impressive views, even while your boat is stationary. 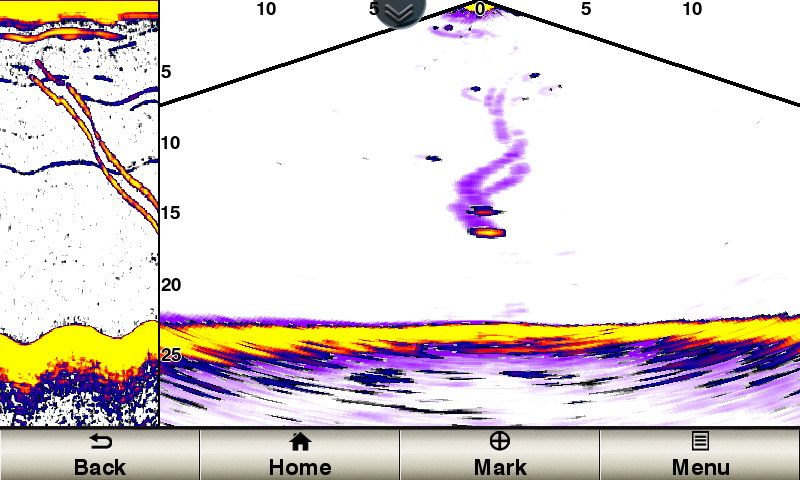 It shows the bottom plus fish and bait swimming in the water column in front of your boat � in real time. You can even see your lure as you reel it in. 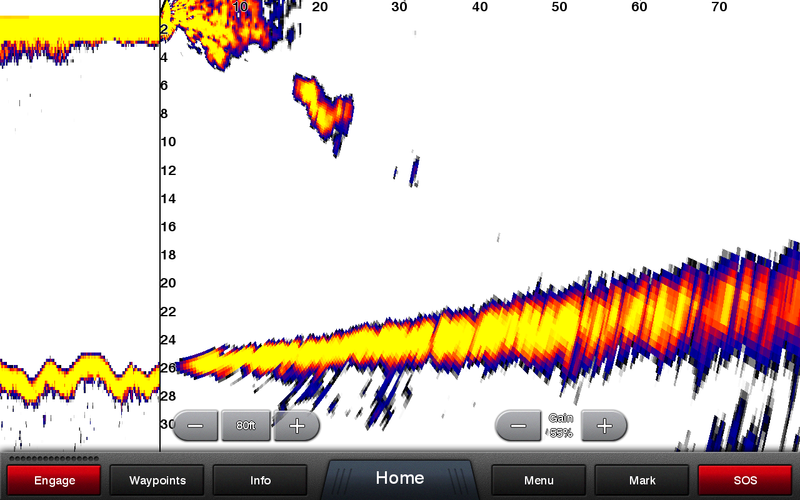 You can also get 3-D views of fish and structure in front of your boat. Updates are provided with a single ping, providing real-time moving images of what�s in the water. This screen shows a large target (a diver) approaching the boat. Wifi can only be used with the below compatible Garmin apps.